Wait. That’s not right. Nor is is a stretch from the truth. Wednesday, October 19 was supposed to be “Brown” day in Kindergarten for Kelsey, full of activities from the beloved story Brown Bear, Brown Bear, What Do You See? by Eric Carle. Instead, Kelsey was admitted to a Children’s Hospital. She was devastated. Whether it was the book itself or the reality that life was not going according to Kindergarten plan, Kelsey was beside herself about missing the day. A Child Life member was kind enough to make sure Kelsey had a Brown Bear to hug during her stay, but even his warmth could not completely wash the tears or the worry away from her eyes. Worry and fear are not the faces a five year old should wear. Earlier that day, Kelsey was in school, hiding her pain and inner torment. Her will is too strong to admit Kindergarten defeat. She said not a word and quietly made it through the day. When I saw her walk out the door wearing a wool sweater on a day that was 86 degrees warm, I could not help but crumble inside. It was the inability to walk, feverish warmth, and the prevalence of deep purple and red lesions all over her legs that led us into the Emergency Room for a second time in two days. Unsettled and uneasy is how we felt with the urgency and abundance of testing that was completed in just a few hours time. Overnight, Kelsey underwent countless scans and even a biopsy to discover the reasons behind her body’s attack. By 3AM, we were void of emotion and fuel in our tanks. We collapsed for a few hours as best as we could manage through the vital checks and check ins. Kelsey awoke the next morning more energetic than she was the evening before, but she was quite cranky and very irritable. Can you blame her? Between the new piece of her body taken out for study and the evening spent without dinner or proper sleep, she had the right to feel any way that she wanted. While I fully supported the crankiness, I just wanted to take the pain away. My poor, fragile little girl is also incidentally my beacon of strength. I have been forcing myself to eat and stay strong through it all. If I am being honest, a new type of distress has recently set in as a result of the unknown and the many unanswered questions this episode raised. 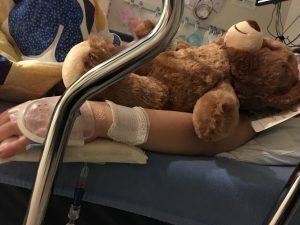 Seeing Brown Bear staring at the IV and watching a five year old girl utterly crippled with pain made my family’s quest for answers even stronger. We pray for strength, we pray for a cure, and we pray for answers, yet again. We can not do it alone. Please join us in these prayers. Please join us on November 25 for a night of hope to help us get one step closer to a cure. Please click on the link to purchase tickets if you have not already done so. We will be raffling a signed jersey from a Chicago Cub playing in the World Series right now, Rodan & Fields products, restaurant gift cards, Tide Water Aquatic Swim School Lessons, Photography sessions, Mary Kay products, a Pandora bracelet and gift card, and many more. A picture is worth a thousand words, or so they say. This weekend, I choose to post a picture of my family enjoying a picture perfect fall day. It received many likes and smiles. What you did not see in the photograph was the pain behind my sunglasses or the tears Kelsey had shed the night before. Kelsey could not walk during the evening hours that preceded the photo and new skin lesions appeared on her ankles that has both doctors and our family concerned. We almost opted out of the family fun due to the pain, but thought that the fresh air and a stroller ride might be therapeutic for us all. Without knowing what the evening would bring, we decided to make hay while the sun was shining. All seemed well and the photographs remind us of the fun we were able to have in spite of worry we had within. However, as soon as Kelsey sat down for the night, her eyes could no longer hide the pain. Her tears of sorrow expressed all of mine, too. The strongest and bravest girl I know was out of courage. Her vulnerability forced my strength. “How do I respond?” I thought as I tried my best to keep it together for my kid. On one hand, I wanted to project everything I was thinking on them. On the other, I just want to smile and discuss nothing at all. “She just hurt her leg. We’re taking her home to take care of it now,” was what I managed to say. Kelsey is full of sunshine and all of those who meet her remark. This is nothing new and even the ER nurses and doctors were enamored with Kelsey and her positive presence. They also noticed me, trying to fight my tears and cover them with the sand-paper-textured paper towels that were present in the room. I was touched when one nurse caught my glance and returned with a box of tissues. She has no idea how perfect her timing actually was. For it was not just my eyes who needed them. My positive and courageous Kelsey needed to utilize the box before we were released, too. Even a five year old’s sunshine can be clouded by all that she can not understand. As we wait for answers, find new marks, watch her closely from a hospital bed, and worry with all that we have within us, we wonder why we can not just keep that sunshine shining brightly all day long. We pray for strength, we pray for a cure, and we pray for answers. Please join us in these prayers. Martin Luther King, Jr. once said, “lightening makes no sound until it strikes.” While I was sure that lightning struck within me once, I recall the emotion and passion evoked from deep within me as I demanded more answers for my child. The truth is that the real storm was just about to begin. It was December 2011. The results of Kelsey’s blood work were due in by the morning. Now on a mission, I called at 8AM sharp. “A doctor will call you with the results as soon as possible,” was the reply I received. “Ok,” was mine because as much as I felt I was ready, I did not actually want to hear the doctor’s words. Bright and early, I was patient. I thought that a doctor may not be in yet for the day. I was “nice” and I was patient. However, that same frustrating phone call happened again at 9AM, 10AM, and every hour on the hour until the thunder came out from within me. At 1PM, I had enough. When the same reply came on the other end of the phone with the woman on the line who I spoke to five other times that day, I physically lost control. I remember getting bright red and angry in a way that I had never been before. Mamma bear was coming out. Looking back, I could have been a bit nicer, but I was not hanging up the phone. I exchanged some unpleasant phrases about the office and the lack of communication that was happening. I must have been persuasive… because one minute later, I had a doctor on the line. I can picture myself like it was yesterday, crouched on hard wood floors hearing, “You need to get to an Emergency Room as soon as possible. CHOP and DuPont would be our recommendations.” I could hardly breathe. Due to the anxiety that filled my brain, the tears that streamed instantaneously, and the dagger I felt drive through my heart, I projected on that poor doctor. I was not kind. I was not nice, and I did not hold back my annoyance at this news coming five hours after it should have. To this day, thinking about the fact that I sat for five hours when I could have been under medical supervision for most of them is almost unbelievable. I wondered what “urgent” meant if it was able to wait five hours. Regardless, I did not take that news quietly. My mom picked my son up almost too filled up with tears to see the doorknob. I could picture her on the couch with the same worried gaze that she wore weeks ago saying, “Something is wrong.” Indeed it was. My husband and I did not speak on our way. There were no words that could prepare us for the days and weeks that would follow. Instead, we clutched tightly to each other. It was the best we could do during the most unnerving and chilling car ride of our lives. Lightening had not struck yet, and therefore we made not a sound. Back in 2007, before I had a clue about parenting or life’s true requirements of working and being a parent, Brendan and I talked about having at least three, maybe even four, children. As 2009 brought us the absolute joy of a baby boy and 2011 delighted us with our baby girl, we had too many blessings to count and ample reasons to be grateful. We had an incredible second mother watching our babies during the day and we would talk about our family wants and needs while surrounded by them at night. Every couple is different and there is no right or wrong. Watching friends struggle to conceive or suffer a loss has been difficult to say the very least. I will light my candle at 7 p.m. on October 15th to honor Pregnancy & Infant Loss Awareness Day for that reason. I am blessed not to have experienced that pain myself. However, I must say that the fear of those losses and the many women I have known endure them started a conversation one night soon after Kelsey was born. Brendan and I decided to table the talk of a third child until after Kelsey’s first birthday. As it turned out, we spent most of December at DuPont Hospital just before her milestone birthday rolled around. The idea of a party was completely out of our minds. I could not have pulled off Kelsey’s first birthday without my mother’s help. She took over the details and even hosted the celebration. Though I was still full of concern and uncertainty, I had a lot to be grateful for that year, too. And so we celebrated thanks to my mom. Reality set in regarding our family growth and how the uncertainty looming over us made it too difficult to consider bringing another child into the world. We sadly decided to close the door on expanding our family. It was a tough decision to make as a couple who adores children. Difficult as it was, we remained grateful for the two beautiful lives we had created. We are still grateful every day for those gifts. Five years later, the idea of a dog came from my son. We have worried about him throughout this summer and how he would react to Kelsey’s Kaleidoscope. He is truly incredible and usually full of joy. But we never want to leave him out and often wonder what the past five years have done to him. Hopefully, it has changed him for the better and given him an appreciation of health and love. However, at only seven, it is realistic to think that there is a part of him that may resent all of our efforts purely because he can not understand them. In fact, we have done our best to withhold the truth from him because he is, in fact, just seven. 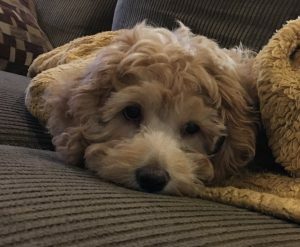 Whether it was that idea heavy on my mind or a feeling of incompleteness as a family, we came home with a Cockapoo. My little Star Wars fan named him Luke Skywalker. I look at Luke now, sleeping like a baby next to me. He is serene and tranquil under a blanket that both of my children were tucked under as babies. Kelsey actually gave it to him from her “baby doll” collection the night we brought him home. Many equate puppies to babies, and though a puppy could never fill the void of another child that I sometimes feel, Luke certainly helps. He is a reminder of the struggles, joys, and early wake-up calls that babies tend to bring near. They say that time heals all wounds. Licks from puppies go a long way in providing healthy distractions at times when we really need them, too. A quick game of fetch after a long day also helps the reality of life fade away for just a few brief moments. Thanks for the distraction, the licks, and the love Luke. May the obedience be with you.